Francis M. Naumann Fine Art is pleased to announce “The Paintings of Walter Pach,” whose work was last on display in New York over sixty years ago (in his solo exhibition at the Laurel Galleries in 1947). 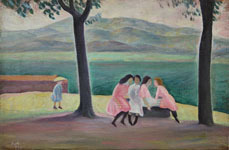 Since the present exhibition includes forty-four paintings and watercolors—beginning with work from his student days and concluding with paintings made in the last decade of his life—the show is designed as a modest retrospective. Pach’s earliest mature works were painted in the bravura style of Impressionism, displaying, to an extent, the influence of his teachers, William Merritt Chase and Robert Henri. 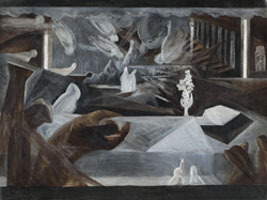 While living and working in Italy in the summers of 1907, 1910 and 1912, Pach heeded the advice of Leo Stein (brother of Gertrude)—who believed that anyone interested in modern art should explore its sources in the paintings of the Italian Renaissance (particularly those of the Quattrocento: artists such as Paolo Uccello and Piero della Francesca). 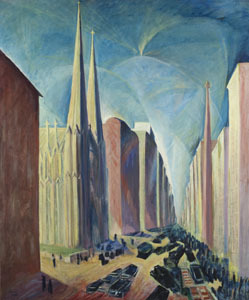 In 1912 he deliberately simplified his imagery and heightened his color palette, yet these changes were incidental when compared to those that took place in his work after the Armory Show. For approximately five years, Pach embraced the most advanced manifestations of the new art coming out of Europe—especially Fauvism and Cubism—and painted among the most vibrant and daringly experimental pictures of his career, excelling especially in his use of watercolor. 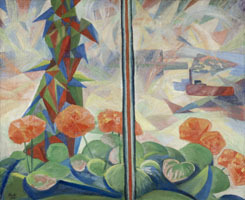 After 1920, he reverted to a figurative style, one that nevertheless retained aspects of his earlier immersion in modernism. 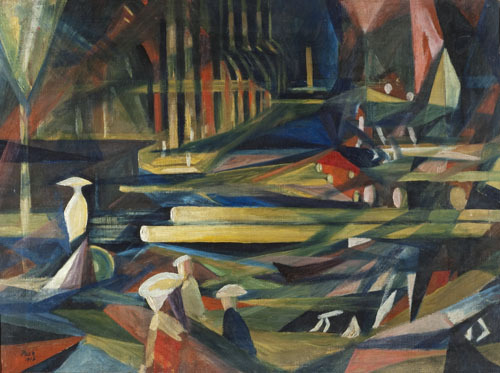 While teaching a course on modern art in Mexico City in 1922, Pach met Diego Rivera, José Clemente Orozco, and a number of other notable Mexican artists. 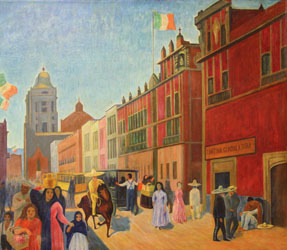 In that year, he painted Street in Mexico, a painting that Rivera thought captured the spirit of Mexican art and life better than anything made by his contemporaries. Although Pach devoted a great deal of time to his writing (he published more than ten books and over 200 articles), he continued to draw and paint throughout the remaining years of his life, seeking inspiration from the various artists whose work he researched and wrote about (especially Eugène Delacroix, whose journals he translated and edited, and Vincent van Gogh, about whom he wrote a monograph). 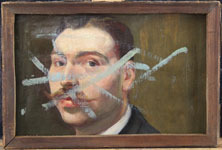 It is hoped that the present exhibition will contribute to a revival of interest in the work of an individual whose artistic contributions were recognized in his day by his peers, as well as by collectors and museums, but which have been neglected in more recent American art history (due in part, to the fact that his work was—heretofore—largely inaccessible and not available for view). This show is designed to commemorate the release of Walter Pach (1883-1958): The Armory Show and the Untold Story of Modern Art in America, the first biography of Walter Pach, written by independent scholar and curator Laurette E. McCarthy and published by Penn State Press. McCarthy also served as curator of the present exhibition and is author of the accompanying catalogue, The Paintings of Walter Pach (available through the gallery).